Life is about more than just existing. It's about learning to exist at a higher level - an Elevated level. Often it takes a fall before we discover a divine, higher power. But ultimately, we can all achieve an Elevated Existence. Following the death of a loved one, the diagnosis of an illness, or other traumatic event, most people find themselves searching for answers to life's big questions - Why did this happen? What is the purpose of it all? How can I stop the suffering? Tammy Mastroberte, founder, publisher and editorial director of Elevated Existence Magazine, and a spirituality and self-improvement expert, found herself in this exact situation after the sudden death of her mother from a brain aneurysm only three days after Christmas in 1999. Eight years later she started Elevated Existence, after 10 years experience in the magazine publishing industry, to share the spiritual and self-help teachings she continues to find comfort in with the hope of making a difference - one reader at a time. Elevated Existence covers a variety of topics in the spiritual and self-improvement field, from the law of attraction, manifestation tools, yoga and meditation, to holistic and alternative healing methods. The goal is to offer tools, techniques and inspiration people can use to improve the quality of their lives. 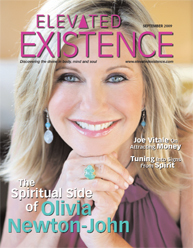 Featured a cover story interview with Joe Vitale, bestselling author featured in the book and movie "The Secret"
Won a Bronze Eddie Award from Folio: Magazine for Best Single Article in the Spiritual/Religious consumer magazine category for the article "Searching for Spirit"
For more information, and to download the first issue with Deepak Chopra for free, visit www.elevatedexistence.com. Copyright 2019 Tammy Mastroberte. All rights reserved. - View Full Version of this Press Kit.